Something smells funny during the great pig race, and its not the pigs! The plucky Dork Steve might not crave adventure, but he sure seems to find it wherever he goes. It's time for his village's very esteemed, annual pig race and to his dismay his petulant friend Alex is dead set on bringing home the gold with her beast of a pig, Martin.Winning is not going to be easy though the competition is stiff. Namely Laura, the cocky young woman who wins every year by treating her pigs cruelly. After the first round of pig races, Laura is not happy that Alex has come into such a close second, and it seems like she will stop at nothing to keep her crown as the pig racing queen!In fact, Martin has gone missing, and Martin's trainer has gone missing as well! Worse, Alex has gotten hurt by a dirty trick Laura pulled at the second pig race. 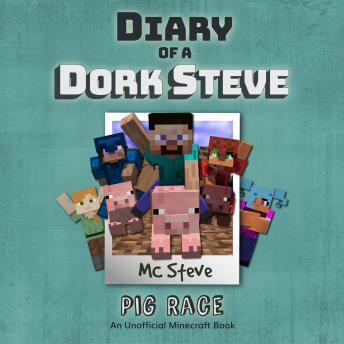 Now it's all up to Dork Steve who wasn't interested in pig racing to begin with, to save the day! Who will win the great pig races this year? Will Steve be able to save the day in time to beat mean spirited Laura? Where has Martin's trainer gone? Listen to Pig Race to find out!Hilarious and sweet, this book is an excellent holiday gift for your little Minecraft fan. They will learn about fairness and friendship, and will enjoy every page as they do so!